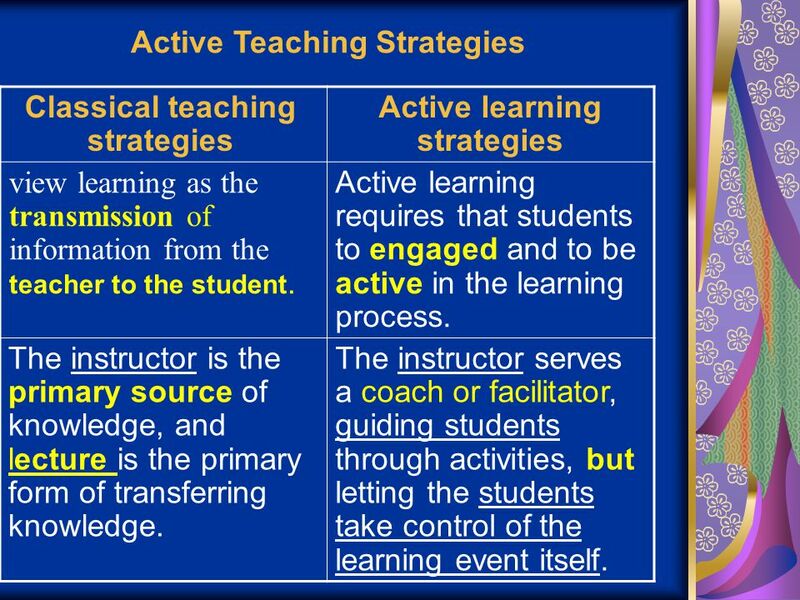 The role of teacher and learner in the activity-based teaching is different from the role in the traditional method of teaching. Many of the changes students will see in our teaching approach can be explained by our desire to bring our teaching into harmony with the new discoveries about how the human brain learns. For example, we want students to do more firsthand learning, group learning, practicing, reflecting, teaching of others, and presentations because all of these learning activities require active learner engagement. We know from neuroscience research that the dendrites of our brain cells only grow when the brain is actively engaged and the neuron-networks formed in our brains only stay connected when they are used repeatedly. We need to continually reinforce to our students that the learning tasks we are asking them to take on, which require them to adopt new learning roles, are done to optimize the development of the neuron-networks they need to be successful college learners. The role of the teacher in this method is the role of the leader who leads an orchestra that plays a nice and regular tune that wins the admiration of the audience in a theatre because of its harmony. He starts his presentation with a warm-up, then he does his presentation. The presentation process must address the 5 senses and the inner feelings of the learner. The teacher uses his mouth, gestures, motion, smiles, miming, acting, classroom management, pointing and signals. The teacher uses real situations as a practical means to present his vocabulary. He uses choral reading and individual reading to present the new words. He talks to the ears, eyes and the interest of his learners. The presentation must satisfy the psychological and emotional side of the learners. The teacher uses visual aids and audio aids beside the real things . He uses 4 skills, namely, listening, speaking , reading and writing to function the vocabulary in sentences, situations and dialogues. The teaching aids include the the role of technology in teaching. The teacher claps once to proclaim the time of individual work then, twice to proclaim the time of pair work in which the learners work in pairs or in peers . One asks and one answers in a form of a mini-dialogue or a small interview. Others correct their mistakes at the time , the teacher monitors, guides and checks. The teacher claps for the third time announcing the time of the group work or team work. Each group or team includes a presenter, an organizer, a dictator, a timer, a writer and an evaluator. Each group competes with the other group in presenting their projects in a comparing and competitive way. The third and fourth group evaluate the previous groups' work in a form of written reports and these reports can be presented through an academic interview inside the classroom. The teacher guides, monitors and checks . The teacher enables the groups of work to use songs, games, music, video tapes, internet, cassette tapes, wall charts, flash cards, designs (made of paper, wood or leather), drawing, painting, jumping and walking. Also, projects are used in teaching. They are the real learning outcomes. The classroom takes the form of a great conference that discusses knowledge that learners have learnt in a practical way. The teacher is just a guide but the learner is the centre of the education process. Interaction, participation, elicitation and expressing one's self, guessing, imagination and thinking can be clearly seen from the side of the learners. evaluate themselves, their peers, and the teacher. How can teachers help students to change? Let the students do the work. Use firsthand learning, self-discovery, self-assessment, performance, and team work. Let discussions take place between students—keep our mouths shut! Have discussion guidelines that require everyone to participate. Help students to see that effort results in improved intelligence and abilities—effort is not an indication of a lack of ability. Authentic Assignments that reflect what the information and skills will be used for in their careers. Relevant Use guest speakers and former students to help map the connections between course material and career work and lifelong learning skills. Interesting Students arrive motivated; teachers need to discover what is motivating them (Zull, 2002). Having some say in what and how to learn keeps students engaged. Important No busy work. Value the work assigned. Value in our students’ minds means the work gets graded. In the GTM method, the teacher starts his lesson with a review for what has been taught in the previous lessons. He uses his blackboard and the set-books as teaching tools in presentation. He can't consult any other resources. He takes care of his regular blackboard to include the ideas, the new vocabulary. He neglects functioning the new vocabulary, idioms, language notes, language expressions, language skills, topic text, language culture or literature. Besides, he rarely uses technology in teaching. The teacher uses the intensive reading then, the individual work through a free discussion. He uses the GTM method of teaching. That method focuses only on grammar and the text translation. He mainly uses the native language to interpret the difficulties of the new vocabulary and the new structure. The teacher doesn't give care to the text content. The learners answer the written exercises in their workbooks and the teacher checks their answers till the bell rings. Always, the learner feels bored. The lesson seems boring. Technology, games, plays, songs or music are not used in teaching. The learners have to learn the new vocabulary or the piece of information by heart as they will deal with them in the final written exam. The teacher is just a dictator and the learner is a passive store or a receiver. There is no interaction, participation or team work. It is a teacher-centered method.There is a big gap between that theoretical teaching and the practical benefit that can help the learner to use his knowledge in his daily life. The information the learners acquire will soon be forgotten. Do you know the following facts? 1- The mediocre teacher tells. 2- The good teacher explains. 4- The superior teacher demonstrates. 5- The great teacher inspires. Can the 2 roles exchange? Neither can teachers afford to distance themselves from the students they teach. In the new, learner-centered environment, they must be prepared to learn both about and from their students. The belief that teacher and student should maintain a partnership based on mutual learning dominates thinking about pedagogical praxis to an ever-increasing extent—from the elementary grades to the college years. The term "dialogue education" has been used to characterize this more equitable relationship between teacher and student: "Two way, open dialogue needs to be a part of all learning activities" . It has been demonstrated that class discussion in which students actively participate and are encouraged to raise questions and pose problems themselves may greatly increase critical thinking skills in students . Thus teachers must be a learner. He must learn how to create an environment in which students feel free to openly express and share their ideas. The perception that learning is a mutual experience in which they participate with the instructor has also been shown to contribute to higher cognitive skills in students . Just as teachers have had to alter their own methods and shift from being their students’ sole source of knowledge to one of the many sources, students also have had to shift from being passive receptacles of knowledge to active participants and even to being teachers themselves. Research in the areas of constructivist teaching practices, cooperative learning, and technology have opened new doors and have altered the roles and responsibilities of students today. One example of how students can accomplish this is through project-based learning. Students can, individually or in groups, generate questions about a real-world problem, investigate the topic through research, analyze and reflect on their findings, and devise solutions to the problem. They then can teach the rest of the students in the class, the teacher, and even the rest of the community about their specific topic. Essentially, they become experts on the topic. In this style of learning, the students take responsibility for their own learning because they truly are interested in it. The teacher must be a learner and the learner can be a teacher. 5-The Role of a Headteacher. 6-Education of a good quality. 9-Teaching diverse and multi-cultured learners in one classroom.